For many decades, flooding to waist depth in places has been a recurring feature of life in Skipton, a town of around 15,000 inhabitants. Run-off from the upland catchment is channelled into two watercourses that pass through the town, Eller Beck from the north and Waller Hill Beck from the east. In the 1982 flood, one life was lost and 570 properties were flooded. About 230 residential and 90 non-residential properties are at risk of flooding during a 1-in-100 year event. Raised flood defences have been constructed in the town, but the major features of the scheme comprise flood storage reservoirs with hydraulic controls on the two watercourses. We will visit the larger of these, on Eller Beck, after the talk. Constructed of some 200,000t of fill, it is 360m long and 14m in height and can retain up to 433,000m3 of flood water. In operation, flows of up to 17m3/s are passed forward in Eller Beck, the excess being retained behind the dam. The whole system is automated, information from sensors being relayed to the Environment Agency's control centre where they can also take control remotely, with local manual operation being a further option if appropriate. The majority of funding for the £14m scheme was met by the Environment Agency but with contributions from DEFRA, North Yorkshire County and Craven District Councils, Yorkshire Regional Flood and Coastal Committee and Yorkshire Water. A key partner in the scheme was Skipton Golf Club which agreed to permit the construction of Eller Beck reservoir on its land. 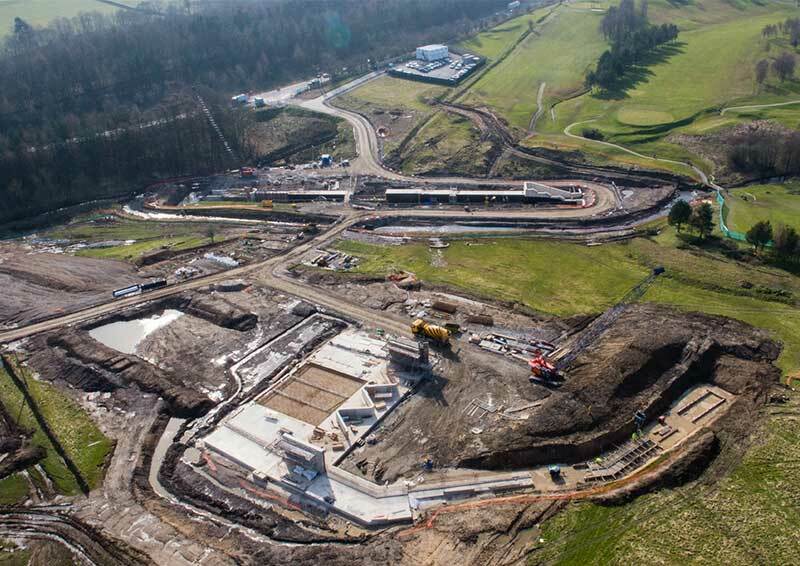 Part of the course was remodelled, requiring the formation of two completely new holes, together with improved practice facilities, drainage works around the course and the replacement and upgrading of existing bridges across Eller Beck. After lunch we will visit the Eller Beck site, which is a short walk from the golf club house. If weather conditions are unfavourable we may drive there as there is room for parking. The site should be under EA control by 12th June so PPE is unlikely to be required, but if it is it will be provided. Tea coffee & biscuits will be served on arrival. As this meeting is outside of the RICE budget allocation from Region, we ask you to pay £2 for this service. Lunch will be taken in the club house dining area, overlooking the golf course and with the Eller Beck works in view. The cost for lunch will be £14 or £12 if you wish a main course only. There is a cash bar adjacent. If you wish to book for this meeting, please advise the Hon Secretary not later than 12.00 on Friday 8th June 2018 giving the information on the form below, either by e-mail to [email protected], or by post to: Hugh Allan, 8 West End Close, Horsforth, Leeds LS18 5JN. The presentation will be given by Oliver Wilson from the Environment Agency, David Neeve from consultants Arup, and David West from contractors Galliford Try.